“(Feb. 2, 2018) Seacrets Spiced Rum and Orange Vodka by Seacrets Distilling Company has been recognized in Cigar & Spirits Best of 2017 World Spirits Competition. Every year, Cigar & Spirits Magazine pours hundreds of spirits, tasting each one for quality and consistency. The expert tasting panel explores 14 categories of spirits. Seacrets Spiced Rum placed second in the Spiced Rum Category, with Maggie’s Farm Spiced Rum in first and Captain Morgan Private Stock taking third. Seacrets Orange Vodka finished third in the Flavored Vodka Category, with Vodka 261 winning top honors and Western Son Big Stripe Watermelon Vodka placing second. Seacrets Spiced Rum was also awarded a silver medal and “Best In Show” by the American Distilling Institute (ADI) in 2017. Seacrets Lemon Drop Vodka and Seacrets Gin also took home ADI bronze medals. 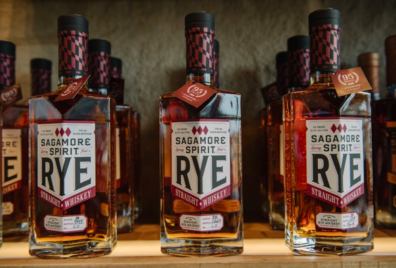 Erected in 2016, Seacrets Distilling Company on 49th Street marks a milestone for the town of Ocean City as the first distillery to be built in Worcester County since the end of Prohibition in 1933. Seacrets Spirits features a premium line of handcrafted spirits, including Spiced Rum, White Rum, Coconut Rum, Gin, Vodka, Orange Vodka, Ruby Red Grapefruit Vodka, Lemon Drop Vodka, American Whiskey and Bourbon Whiskey. The full Seacrets Spirits line is available for sale at the Seacrets Distillery and distributed by Republic National Distributing Company throughout Maryland and Washington D.C. Expansion of the brand into surrounding mid-Atlantic states is expected in the near future.